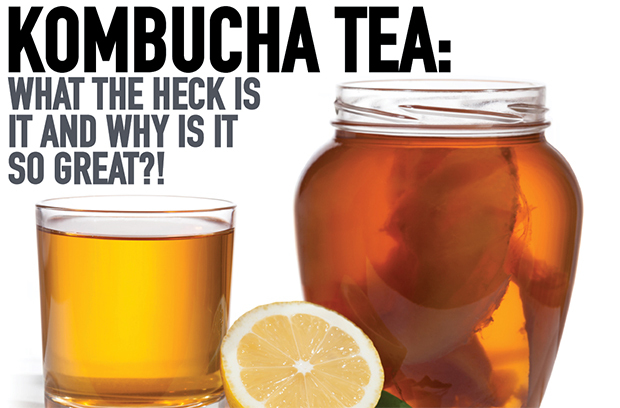 KOMBUCHA TEA – what the heck is it and why is it so great?! Kombucha is already wildly popular among health aficionados, and it seems like it’s occupying more and more shelf space at every big box grocery store too! What exactly is kombucha, and why is it so damn popular? Kombucha is a symbiotic culture of bacteria and yeast (also referred to as SCOBY). It’s derived from the fermentation of specific bacteria strains and yeast with black tea, sugar, and other ingredients. The fermentation process lasts for about one week, and during this process, the bacteria and yeast form a mushroom-like film on the surface of the liquid. This mushroom-like blob or film is most commonly referred to as the “mother,” which is a living symbiotic colony of bacteria and yeast. The fermentation process also produces acetic acid (also found in apple cider vinegar) and many other acidic compounds, alcohol, and gasses that make it slightly carbonated. Kombucha can also be a great source of B vitamins. All of the kombucha sold in stores is usually less than 0.5 percent alcohol volume (or at least it should be)! Kombucha is always processed and sold in glass containers because the vinegar and ethanol content has the potential to leach lead and other toxic chemicals from the walls of preparation and storage containers. Advocates of kombucha (myself included) have attributed many therapeutic effects to the drink. The main reason I drink kombucha is for gut health. It’s a great source of probiotics, especially for those who are looking for a vegan source. Kombucha contains several species of lactic-acid bacteria and can support a healthy gut. One of the key compounds found in kombucha, acetic acid, has the ability to kill bad bacteria and fight harmful microorganisms (but do no harm to the “good” bacteria). Kombucha can also boost the immune system and support healthy blood sugar and cholesterol levels.